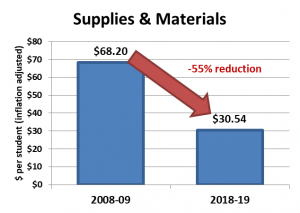 This chart shows state spending on school supplies and materials has decreased 55 percent since the 2008-09 school year. 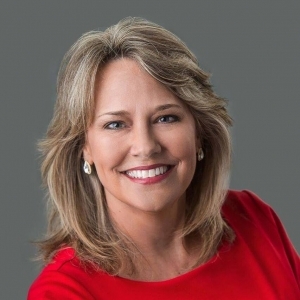 Johnson’s remarks followed comments by SBE member Patricia Willoughby who used the idiom “robbing Peter to pay Paul” to describe the proposal during a board discussion about the plan, Senate Bill 580. Under SB 580, announced Wednesday by Johnson and State Sen. Andy Wells, (R- Catawba), nearly $40 million in state money allocated for districts to purchase school and classroom supplies would be given to teachers who would buy their own. Teachers would use the ClassWallet app to spend the $400 or to claim reimbursements for money they spend out-of-pocket. The discussion about the SB 580 spilled into the SBE’s monthly business meeting after Lisa Godwin, the 2017 Teacher of the Year who sits on the board, explained why she changed her mind about supporting the bill. Godwin said she was initially “hooked” because she believed the plan would be funded with new state money, something for which she’d lobbied. “That’s what I thought I was getting,” Godwin said. But after learning Senate Bill 580 would be funded with money the state already gives districts to pay for school supplies, Godwin skipped a press conference Johnson called to announce the plan. Godwin was listed as a participant on a news release about the event. “I have to stand on my conviction,” Godwin said. “If I don’t think it’s good for teachers and students, I can’t support it. 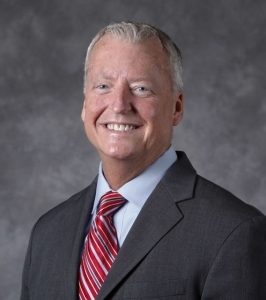 Willoughby said the flare up over funding for supplies highlights the need to take advantage of the varied experiences of board members before unveiling such a proposal. “A lot of times we make better decisions when we talk about things collectively before something just gets rolled out,” Willoughby said. Willoughby took issue with Wells who accused school districts of misspending state school supply allocations. Meanwhile, Johnson, facing questions from board members, noted that a request to lawmakers for additional money for supplies has been made. “I have requested new money and this board has requested new money and those conversations are ongoing,” Johnson said. Cecilia Holden, director of legislative affairs for the board, said the request for the board totals $18 million in new dollars for instructional supplies, and it’s supported by Johnson. Currently, the state allocates roughly $50 million for school supplies to North Carolina’s school districts. If SB 580 is approved, more than $37 million would be redistributed to teachers. Godwin, an Onslow County elementary school teacher, said Wednesday that she’s concerned SB 580 would weaken the buying power of school districts, which are able to negotiate discounts by buying in bulk. She also worries that the $400 won’t carry school teachers through and entire year. Godwin said the $700 a year she now receives to purchase supplies for about 24 students isn’t enough. The North Carolina Association of Educators (NCAE) weighed in on the bill Thursday. Jewell said SB 580 needs work. SBE Chairman Eric Davis said the SB 580 has shined a light on the desperate needs of teachers. You could have also added that we need to know the overhead going to the private app owner instead of for the benefit of teachers. And how does this address realities such as science teachers need significantly more supplies than civics teachers? You also need to ask exactly why ClassWallet has been chosen to be the app by which teachers are expected to spend this $400. Who is connected to or invested in this company (or its backers.) What political favors were called in that they were chosen for this? There’s no end to the questions here, beyond the obvious shell game that is being pulled on districts and teachers,as though we won’t notice that Johnson is indeed robbing Peter to pay Paul and probably having a friend take a cut along the way to boot.